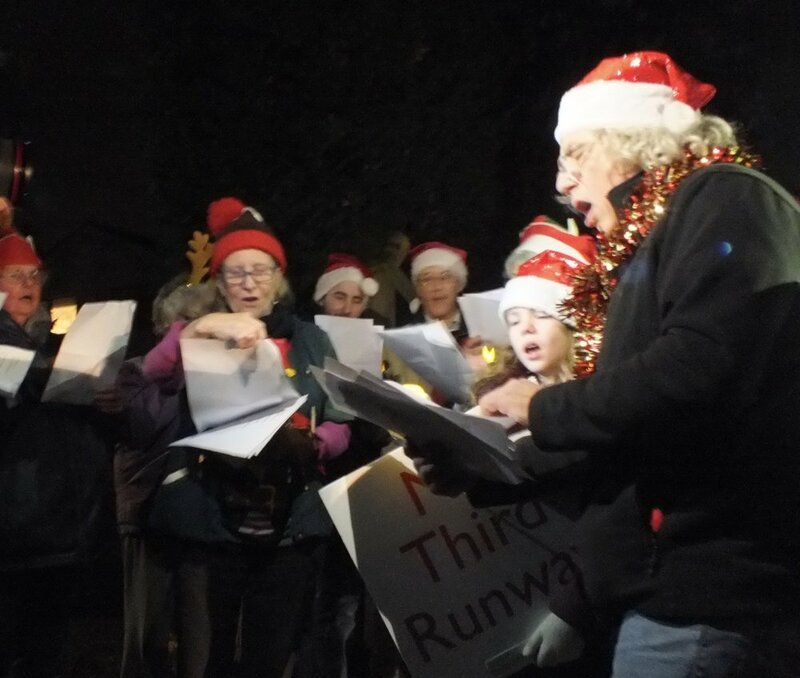 A group of residents facing the misery that would result from a third runway made a light-hearted festive protest outside the home of the Secretary of State for Transport, Chris Grayling by singing re-worded Christmas carols on the last night of the government consultation. Only a couple of the campaigners knew the destination in advance so it wasn't until leaving Harmondsworth that everyone discovered they would be singing outside Grayling's house, his retreat from the daily grind of plotting the destruction of other people's homes. Looking down the drive from the road and seeing the sprawling detached house with it's huge Christmas tree displayed in the uncurtained front window, it is easy to see why our Secretary State has no comprehension of the misery he will inflict on others with a third runway. Ho! Ho! Ho! Time for refreshments - Rudolph can't wait. At one point, there was the sound of a solitary aircraft flying thousands of feet in the sky above. It demonstrated how hard it is to totally escape aircraft noise if you live anywhere near London, but it also makes you wonder if Grayling assumes this is anything like the reality of 24/7 airport noise. Heathrow has regular flights when people are trying to sleep (an activity that won't be banned with R3); HGV vehicles use and abuse local roads throughout the night; engine testing can take place at any time - even 4am; noisy road and plant maintenance is scheduled for times convenient for travellers NOT for those living nearby. A festive reminder that groups opposed to Heathrow expansion continue their fight against R3. A quick search online revealed the house was bought 17 years ago, about the same time that residents in the Heathrow Villages have been living under threat of a third runway. During that time Grayling has enjoyed the security of knowing he has a home for his family for as long as he wishes to stay there. Meanwhile, thousands of others, thanks to our government, have had their homes repeatedly threatened with destruction or feared an increase in aircraft numbers and noise. The campaigners are focused - which is more than can be said for the low-light photography! Long-time campaigners know that not only do senior politicians, like Grayling, have no understanding of the impact on the lives of residents in those situations, they also don't want to know. It is easier to destroy vast areas when you don't have to confront the reality. Should the going get tough, these politicians can just disappear from public life and go home to their safe and cosy £1.7million investment, close to outstanding schools and all the other things that people suffering near Heathrow can only dream about. Does anyone remember Labour Secretary of Secretary for Transport Ruth Kelly? She supported a third runway and wouldn't listen to why it was undeliverable. Before long her political career and her plans for Heathrow expansion went down the pan. When the Graylings celebrate during the holidays, we hope they will spare a thought for people who face another Christmas under threat and reflect on their situation. — Verse to the tune of "Ding Dong Merrily on High"
After singing of being given hope, the group passed this poster..